Accel World is a popular anime series based on a series of popular light novels centering around a secret MMORPG fighting game that gives you startling powers in the real world. While this seems like the perfect setting for a fighting game tie-in, its first game is instead an odd cross between a dating sim and a turn-based RPG. And while the crossing of the two genres is an interesting concept, the actual execution has more than a few flaws. Chronologically, Awakening of the Silver Wings starts right after the fifth episode of the anime series. However, instead of following the exact story as told in the anime, the game allows itself some leeway with the order of events—not to mention adding a ton of events specific to the game only. The dating sim portions of the game expand the plot's more personal elements—even giving the player the option to see how the story unfolds should Haruyuki pursue a girl other than Snow Black. 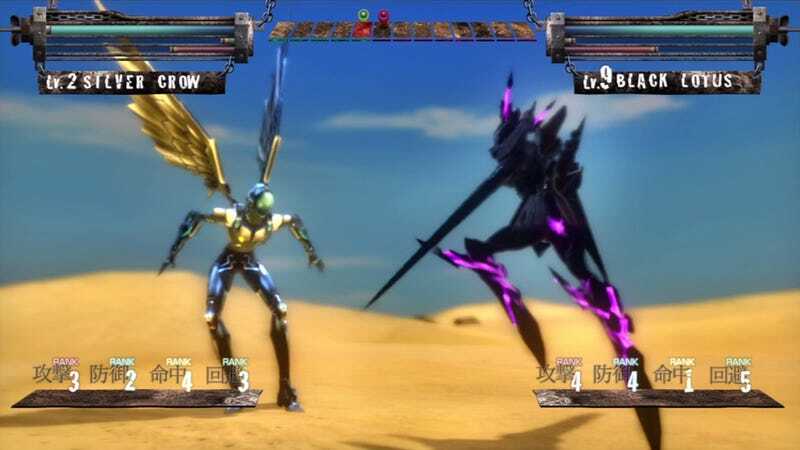 Basically, the main draw in this game is seeing the different ways the Accel World story can be told and experiencing the unique surprises therein. began playing the game, I was thrilled to see not only that the entire cast had returned, but also that their performances were on par with the anime. The only weird thing is that in the real world, Haruyuki, the player character, is unvoiced—as is the norm for most dating sims and visual novels. However, in the virtual world, he is fully voiced. It makes for an odd disconnect, though it doesn't really affect the game negatively. The moment you turn on the game, one of the characters at random gives his or her own version of the game's anti-piracy statement, complete with side comments and character-specific flourishes. Then when installing the game, Haruyuki and Snow Black discuss that, in old games, you used to have to install the game—with Snow Black finding the whole idea stupid, to say the least. This is followed by the Red King and her maid discussing all the things they can possibly do during the game's install —before hopping on the maid's motorcycle for a quick visit to Haruyuki's. I think this is the first time I can ever say I enjoyed the act of installing a game. And best of all, this type of humor continues throughout the game itself. You Got Your JRPG in my Dating Sim! your opponent does the same. As you dive into the VR world over and over, you start to learn each enemy's base stats and how you need to alter yours to beat them. Before long your level 2 Silver Crow will have no trouble with Snow Black's level 9 Black Lotus—which, in terms of the plot, is kind of ridiculous. The biggest problem with this system is how slow it is. A battle could take anywhere from three minutes to ten minutes, depending on the type of enemy you're facing and how good you are at guessing his or her stats. If you want to play the game in the best possible way, you have to battle once a day. And as the game takes place over a period of several months, you can imagine how monotonous the battles are when all you want to do is further the plot. But even worse, there aren't very many different enemies to fight—especially near the beginning. Even when you do start facing more varied enemies, they tend to fall into one of two categories—high defense or high evade—and either type is easy enough to deal with. In short, the constant battling felt more like filler than fun. The game's other issue is a technical one. Despite installing the game to my PS3's hard drive, I was constantly plagued by loading times. Transitioning from the dating sim menu to the turn-based battles took a good 20 seconds. But this wasn't the only time I had loading issues. Even during the game's talking scenes the game struggles. Whenever a new character enters the conversation, there is a good five second pause as the character's model loads—completely breaking the natural flow of the conversation and pulling you out of the game. Accel World: Awakening of the Silver Wings is not a bad game for the dating sim genre. While not as complex as most, it is well voiced and looks great. The turn-based battles are a mixed blessing as the system is unique and interesting, but at the same time, doesn't allow for enough variety to keep the battles themselves interesting. All in all, this is a game that should be played only by fans of the series or dating sim aficionados; everyone else should probably stand clear. Accel World: Awakening of the Silver Wings was released in Japan on September 13, 2012, for the PlayStation 3 and PlayStation Portable. There are no plans for an international release.